Sadler’s Wells is continuing to expand its remit, for the first time co-producing an event at The Royal Albert Hall on November 2: musician Nitin Sawhney, an associate artist at Sadler’s Wells, is performing takes from his most recent album, Dystopian Dream accompanied by singer Joss Stone and other guests. Already known in dance circles for his compositions for Akram Khan (Vertical Road, Zero Degrees, ITMOi and Bahok), Sawhney’s event will feature dance by the Wang Ramirez duo in their first appearance at The Royal Albert Hall. 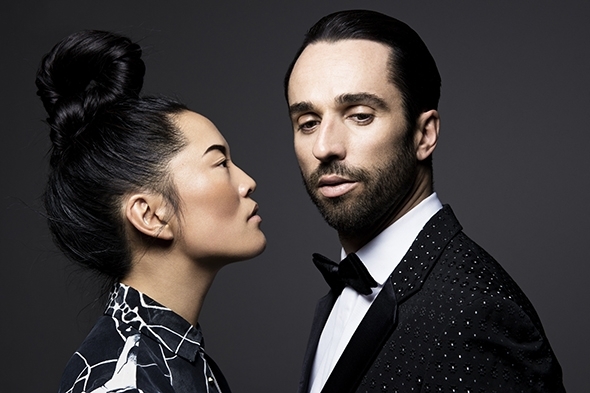 Honji Wang has already danced with Khan — so many roads lead to and from Khan, another Sadler’s Wells associate artist — but in her partnership with Sébastien Ramirez she has performed with flamenco dancer Rocío Molina, in hip hop, and for the Rebel Heart Tour with Madonna for which Ramirez provided choreography. Wang was born of Korean parents in Germany. She studied gymnastics, classical ballet and hip hop with a flavour of martial arts. Ramirez is a French b-boy of Spanish origin who shares with Wang a start in gymnastics and a love of martial arts, with further interests in capoeira, boxing and Brazilian jujitsu. His career was already under way when he met Wang in 2004 at a freestyle event in Berlin. With their cultural identities and complementary dance forms already intermixed, the duo has openly searched for ways to cross-fertilize with other styles and traditions. Performing to the music of Sawhney is a continuation of that path. Wang uses an imaginative image to describe her approach to artists working in different styles: “I’m extremely nosy to experience their cocoon; I want to enter like a little mouse and see what they see.” Perhaps it is this willingness to see through the eyes of others that makes Wang Ramirez collaborations so seamless. When I saw her dance with Khan last year Wang remained faithful to her own dance but complemented Khan in her power and fluidity. Whatever the outcome on November 2, Wang Ramirez will not simply accompany Sawhney’s music; they are catalysts who will transform it through their own alchemy while letting the music transform them. That’s after all the true nature of an artistic collaboration.